Exersaucer Vs Jumperoo - Which One Is Best For Your Child? You are here: Home / Therapy / Exersaucer Vs Jumperoo – Which One Is Best For Your Child? Exersaucer Vs Jumperoo – Which One Is Best For Your Child? Exersaucer’s and Jumperoo’s are one of the first things new parents want to buy for their baby. But there’s so many questions. What’s the best exersaucer? Jumperoo versus Exersaucer? Exersaucer or Jumperoo? It’s enough to make your head spin. And as a parent the last thing you need is another thing to stress out about. By the way, be sure to check out the top 10 toys that have really worked out great for our baby. While your there be sure to add any of your child’s favorite toys to the list. Exersaucer Versus Jumperoo Vs Jumper – Which One Is Best For Your Baby? Before Noah was born I had no idea there was such a heated debate among parents regarding the use of an exersaucer or jumperoo. A quick google search will bring up countless pages (and arguments) about the pros and cons of using one or the other. Wow! Exersaucer or jumperoo? Which one should you buy? Our son was born with Down syndrome, and my wife and I are strong supporters of early childhood intervention, to help them reach their milestones. Our son gets to spend a lot of time with some of the best physical and occupational therapists in the world. So you better believe when it came time for us to make a decision regarding a jumperoo or exersaucer we picked their brains. I mean why not, their experts when it comes to this sort of stuff! After talking to the experts about the use of an exersaucer or jumperoo it was clear that an exersaucer was the best option. I’ll list some of the best exersaucers you can buy, and finally tell you which one we bought our son and three reasons why we really like it. 1. Evenflo Splash Mega Exersaucer – This exersaucer by Evenflo gets great review’s from parents, and has lots of fun activities to keep your baby entertained. The evenflo splash mega exersaucer is a great choice. 2. 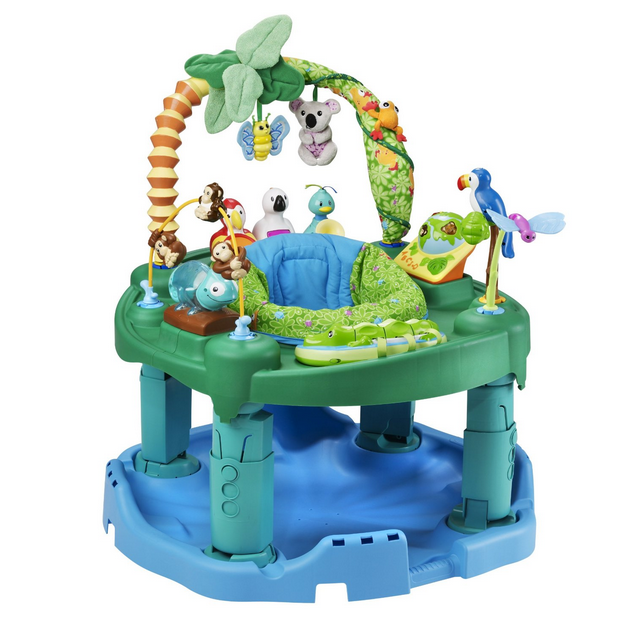 The Baby Einstein Around The World Discovery Center : This discovery center (another name for exersaucer) by Baby Einstein is another great choice. It’s very colorful, lots of fun items to engage your baby, and very easy to put together; which make it a traffic choice. 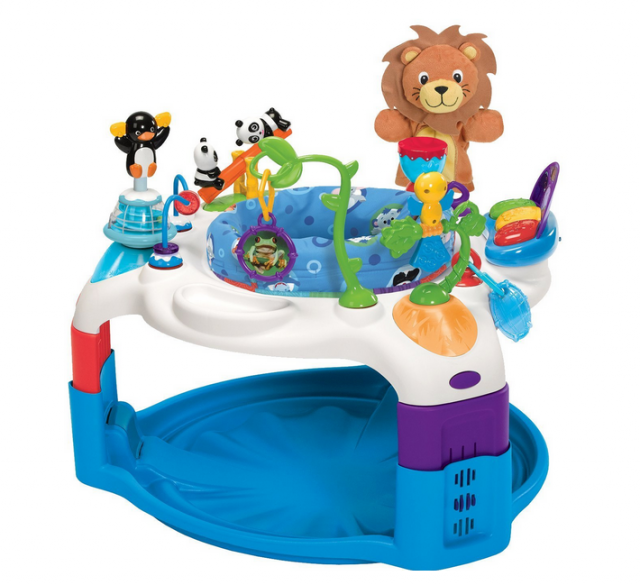 The baby einstein exersaucer is sure to keep your little one busy! 3. The Evenflo Triple Fun Exersaucer is a very popular model due to the fact that not only are you purchasing a great exersaucer for your baby, but included in the box is a playmat and activity table. So you get three excellent items for your baby in one convenient package. Talk about a triple win! The triple fun exersaucer is a triple win! So which one did we buy for our son? While all three of these exersaucer would suit your babies needs well, we actually went with the Baby Einstein Exersaucer. The model in the video is actually the older model of the one we linked to. 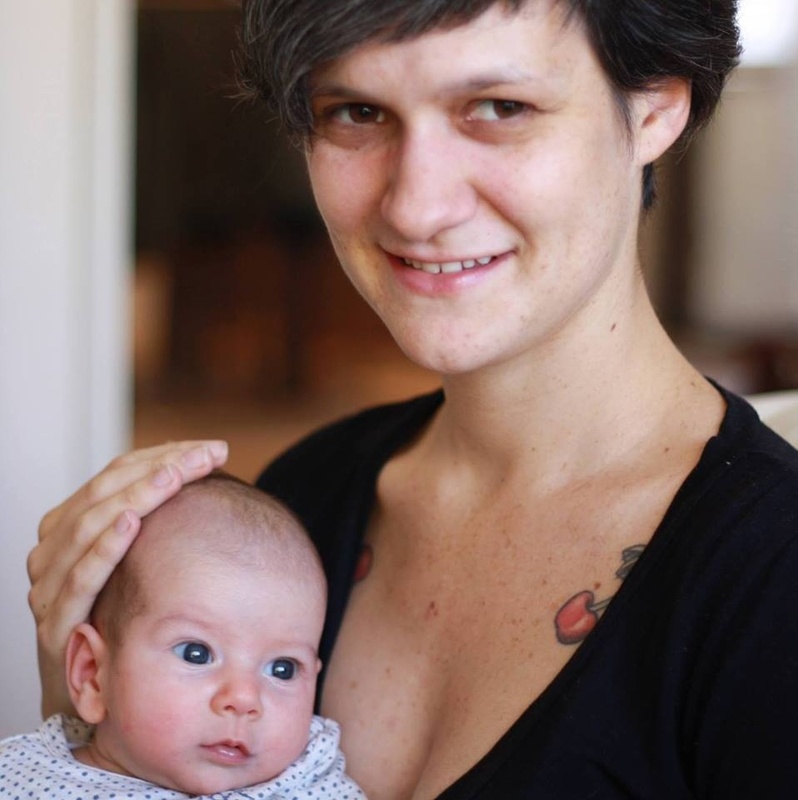 In fact Noah gets a ton of use out of it, and it even helped him develop the core strength needed to meet some of his developmental milestones. 1. Supportive Seat: One of the physical characteristics of children born with Down syndrome is low muscle tone (hypotonia.) This is especially true early on as they are working hard on developing their core and learning how to sit up. Oddly enough many developmental toys are designed for typically developing children, and don’t work well for children born with Down syndrome. 2. Sensory Development: After Noah’s first visit to the physical therapist we learned how much he enjoys anything that makes noise and lights up. The louder and brighter the better! In fact, all children can greatly benefit from the excellent sensory development that bright and loud (and perhaps sometimes annoying) toys provide. 3. 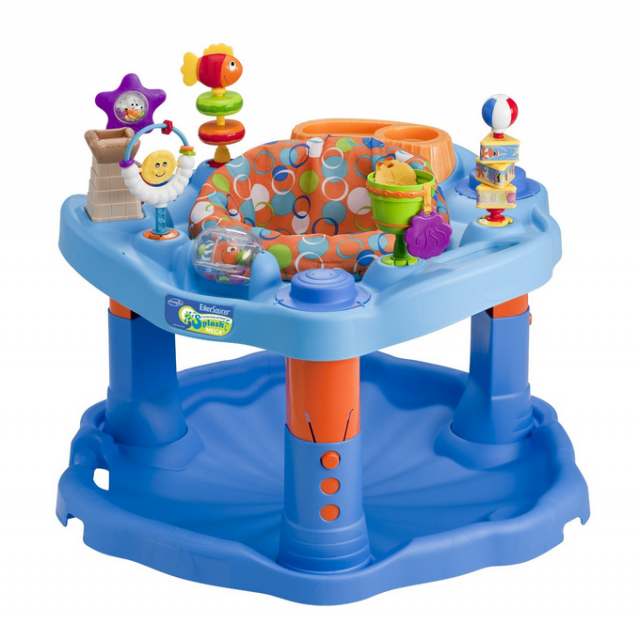 Variety of Fun Activities: It addition to the great sensory stimulation mentioned above, this exersaucer has 7 other excellent “stimulation stations” Noah seems to enjoy all of them, and doesn’t get board while he is hard at work playing. The exersaucer makes a great babysitter while you are cooking dinner, or need to get a little work done. We keep our exersaucer close to the kitchen, and have found it’s perfect for entertaining Noah for a few minutes while mommy puts something yummy in the oven. We don’t leave Noah in his there more than 20 minutes or so at a time, but for those 15-20 minutes it can be very helpful.. I once heard a mom refer to an exersaucer as their baby’s office, and after watching the way Noah handles his (fun and playful) business in his I can see why! Noah really enjoys hanging out and playing in his developmental office and knows it’s his own little space. It’s so much fun watching him enjoy it. If you found this article helpful, please take a second to click the LIKE button on the left and check out our awesome and growing Facebook community with over 15 thousand parents waiting to meet you. Please be sure to enter your email below and stay up to date on all of our newest posts. So parents…what’s your opinion? Exersaucers vs Jumperoo ? Which way are you leaning and why? Have you tried any of the ones on our list? Is there another model we left out, that should be added to the list? Take a second to leave a comment below and let us know. My daughters’ preschool put her in one similar and in no time at all she was standing. Just ordered one for our six month old! Can’t wait to see the fun he has in it! Which one did you guys go with? Be sure to tell us how you and your little one enjoy it. Check with your therapist / pediatrician first, but if they are ok with it, I say go for it! Amazon has some great prices, or if you don’t mind going used craigslist will have TONS and at great prices. Be sure to let us know which one you went with. Your daughter is about the same age as Noah…how fun! Thanks for your comment…we are about to move into a new house and I was thinking of getting the Johnny Jump Up! i was worried about it coming down, and not holding up (our little man likes to go wild!) Was it easy to install? Does it seem super safe and secure? Did you worry about it coming down when you first got it? Our little Noah would really like one I know! Our physical therapist has been our “go to” person for aside. She nixed the jumpers and high fives the exersaucer. We got ours from a friend an anxiously await the day Enzo can try it. Sounds like you have a great therapist! Out Physio told us not to use them and there were sooo very many times i would have loved one – we spend ages encouraging our kids to move and then when they do we want to trap them in one place for a few minutes, so we can pick up the turmoil and carnage they created in another place. I end up cooking with her at my trouser legs and feet some days – others i just don;t bother cooking! Alyson has been sitting in hers for months now. It started off as her hanging/sitting on it (with some pillow for inner support). But now she’s actually standing in it. That’s great! So awesome! Are you guys connected with us on Facebook? (http://facebook.com/noahsdadcom/) I’d love for you to post some pictures of Alyson some time! We enjoy all the pictures everyone posts! I haven’t, but it sounds like lots of fun. What are some of the things you (or should I say your child) likes about it? As I am paediatric Physiotherapist I feel that Jumperoo’s or Jolly Jumpers are out!!!! Exersaucers should only be used for a maximum of 20 minutes once a day!!! Yes they are great babysitters and good for allowing babies to use their hands to touch and play. They are also good to get little ones with low tone to start weight bearing through their legs. HOWEVER – we do find that children who are left in the exersaucer for too long do not develop their trunk rotational muscles, which may lead to a delay in transitional movements, especially if the child has low tone! Also if the child is fitted so that the feet are just touching, this may also result in toe walking – so make sure that the child is fitted so that the feet touch the base fully and that the knees are slightly bent!!! Rick what a wonderful post, very informative. I have to agree about the choice of an exersaucer being the better choice for a child with low tone. 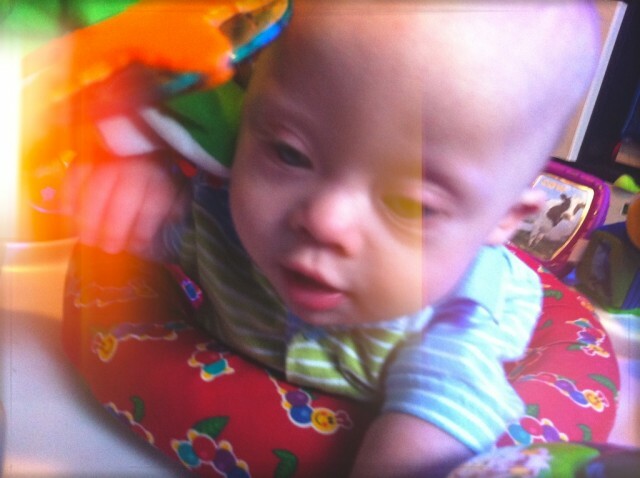 I shared your post in my post http://www.special-and-determined.com/down-syndrome/sharing-a-great-post-exersaucer-vs-jumperoo/. Thanks for being such a wonderful resource and such an advocate. I wanted to weigh in on this post because we were just recently discussing it with my son’s physical therapist. My little boy (now 4 months old) has Down syndrome, and his PT said that because of the typical instability of the atlanto-axial joint which occurs in approximately 15% of people with DS, probably due to ligamental laxity, it is best NOT to use a jumperoo. If the baby jumps too enthusiastically, their heads can bobble too much, and it may lead to the neurologic symptoms of spinal cord compression. It can be very dangerous, he told us. So for that reason, we opted to bring our jumperoo back and get the Baby Einstein exersaucer. It seems to be the safer choice, while still offering him stimulation and helping him develop core strength. Of course, he hasn’t been put in it yet (still learning to hold up his head) but I think he’s really going to love it once he gets just a little older. Thanks for sharing and helping with the advice! Ours is on the way. First of all Noah is a beautiful little boy!! Secondly I’m glad I found this site because I just bought an excersaucer for my 4 month old daughter. She’s still a little overwhelmed by it but enjoys a few minutes at a time. I would like to know at what point bubs can start using an exersaucer. I’ve been trying to find out and different websites say different things. Is it once they can hold their head or is it once they can sit up unassisted? My little one is 4 months. She has been able to hold her head from about 2 and a half months but she can’t sit up by herself for more than a few seconds before she topples over. Also on choice of exersaucer – I was leaning towards the baby Einstein but when I googled it one of the search results was about a product recall due to safety concerns. Hi thank you so much for sharing! Was still deciding between these 2. Thinking of getting preloved from other parents. Just gotten one exersaucer! Can’t wait to clean them before letting my Cayven try on! He is 7 months now. So excited! God bless you and your love ones abundantly. Awesome! You’ll be happy with it. How old are your children? And great blog by the way, thanks for linking to this post in yours! Thanks for sharing and helping with the advice! Thanks for your valuable information regarding Exersaucer Vs Jumperoo. Actually, I was looking for an exact information about this topic. After doing google I found your website and I got my answer. Surely I am going to buy Evenflo Triple Fun ExerSaucer for my daughter. I prefer exersaucer for my baby.Because for jumperoo they need to be taller. Exersaucer is preferable for little kids, I guess. Thanks for your post.Learned a lot of new things from you.Thanks for sharing. I used exersaucer for my baby over jumperoo because my baby was a bit short and it was easier for him to move around. Thank you for sharing this article. I realized, nobody understand us, me, my son, our family, maybe you. My son´s illness isn´t Down Syndrom, but Pelizaeus Merzbacher Syndrom. However, I hope you will be psychological support for me. It seems, time works against us. We tryied also a lot of various possibility, but development of my son began more slow down. Maybe, he will walking never. And I fell very helpless. Eveybody care on his own, I have two different children and it´s my work, my problem. I think buying a jumperoo for my baby was one of the best things I ever done! My baby used exersaucer. It is easy to move around. Thanks for great tips. Exersaucer is the best for my baby because it’s support system & moving is better than others. It’s usable for all baby.